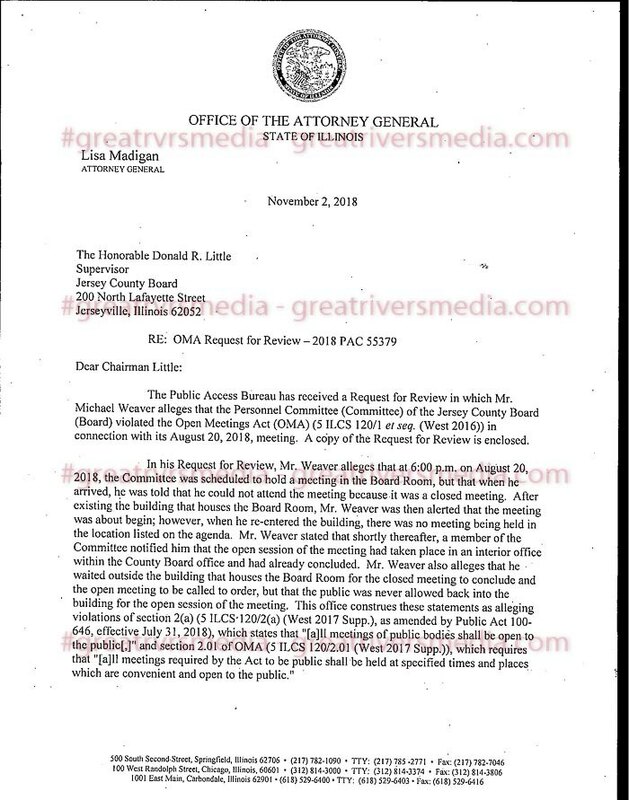 JERSEYVILLE - If Jersey County Board Chairman Don Little doesn't have it already, the notice from Attorney General Lisa Madigan's office informing him of a complaint filed by greatriversmedia.com should be arriving shortly. The complaint was filed after it was clear that the minutes of the improper meeting in question did not accurately reflect what had occurred and only after attention was brought to this error, no action was taken by the board to investigate or correct the meeting minutes. This event is not the only violation in recent months by various board committees. The meeting at issue had in attendance several board members that are up for reelection and appealing for community support, including Chairman Don Little, Sandy Hefner and Gary Krueger. Other board members not up for reelection included Brian Kanallakan and Mary Kirbach. Not one board member spoke out during the incident to stop or discuss Chairman Little's improper actions. Each elected official is supposed to undergo training and certification that they understand the Open Meetings Act. Other governmental transparency related issues may have occurred over the past year as well.